Wachovia Bank and Matrix Development Group this week celebrated the official opening of Wachovia’s regional headquarters in a new, five-story office building in the heart of downtown Trenton. The $15.7 million project marks the first significant private investment in commercial office development in the city in more than a decade. Wachovia cited its desire to follow its urban investments and help be a catalyst for urban revitalization in its decision to relocate from the suburbs. 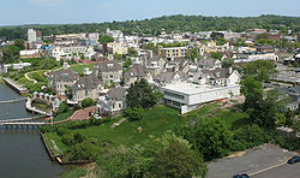 New Jersey Future will honor the two corporations for their ongoing commitment to redevelopment with a Smart Growth Leadership Award at their Annual Smart Growth Awards Celebration, with special recognition to the City of Trenton for this project. 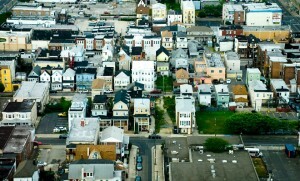 New Census figures suggest that New Jersey’s population may not be growing as fast as predicted. Such news makes the location of new growth and development even more critical to the state’s future prosperity. The partnership between Wachovia and Matrix Development, which transformed a surface parking lot into 66,500 square feet of downtown office and retail space, exemplifies the type of redevelopment leadership that strengthens New Jersey economically, socially and environmentally. Redevelopment is the best way to ensure new development is cost efficient, maximizing investments already made in roads, sewers and other infrastructure. Redevelopment of older communities also restores choices in housing and offers the best way to link employers to large groups of employees, and to transit options that can unclog our roads. Redevelopment allows us to accommodate growth without giving up our last parks and farms and without increasing traffic congestion. It is the essence of smarter growth.